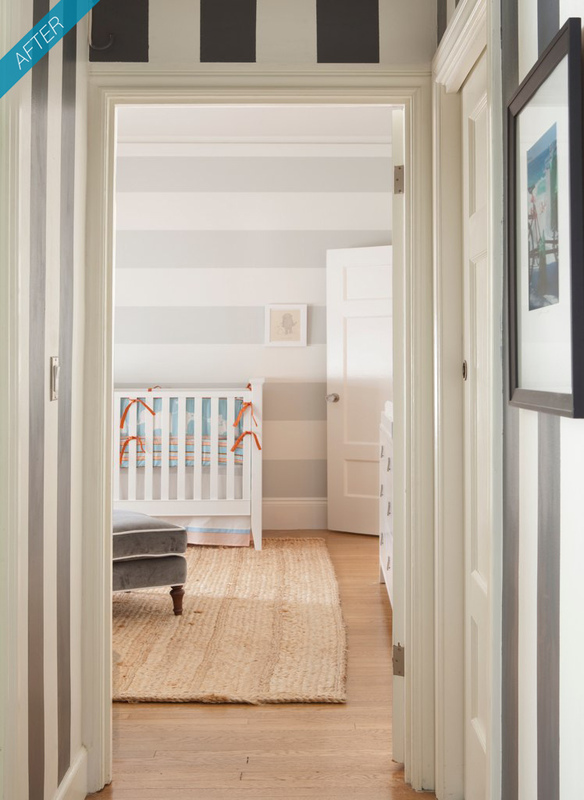 This nursery was designed by Lindsay Anyon Brier for her son Hawken (how cute is that name first of all). And was featured on Raenovate this week. The subtle grey and white horizontal stripes in the room create a wonderful classically modern neutral base for the bright turquoise and orange Ben bedding by Serena & Lily. Also take note that the furniture in the room is not all from the same source. The crib is the Sutton from Restoration Hardware and the bookcases are from Pottery Barn while the changer is from West Elm. The pieces are all white but are not matchy matchy, and doesn't it look great? I really like how she paired the contrasting grey ottoman with the white chair, another unexpected twist that works really well. The jute rug adds a wonderful layer of texture to the room and the orange bent wood side table reiterates the thought of the bright orange. 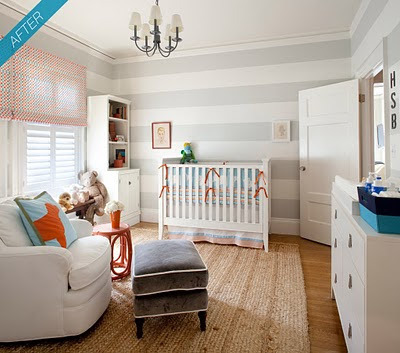 The artwork is simple as it should be with the dominant horizontal stripes around the room. Such a lovely space, Lindsay you are a very talented designer. For more information regarding the sources for items in the nursery please visit the blog Raenovate and thank you again to Tina to forwarding this to me. And congrats to your new son Lindsay! Thanks Andrika for the lovely posting! I love stripes!! They are so tailored and classy. Love it. But I wonder how the jute feels under bare feet or when the baby starts crawling? thank you for the shout-out, andrika! your blog is lovely. Hey Andrika! This is Dawn Newell from TVS. 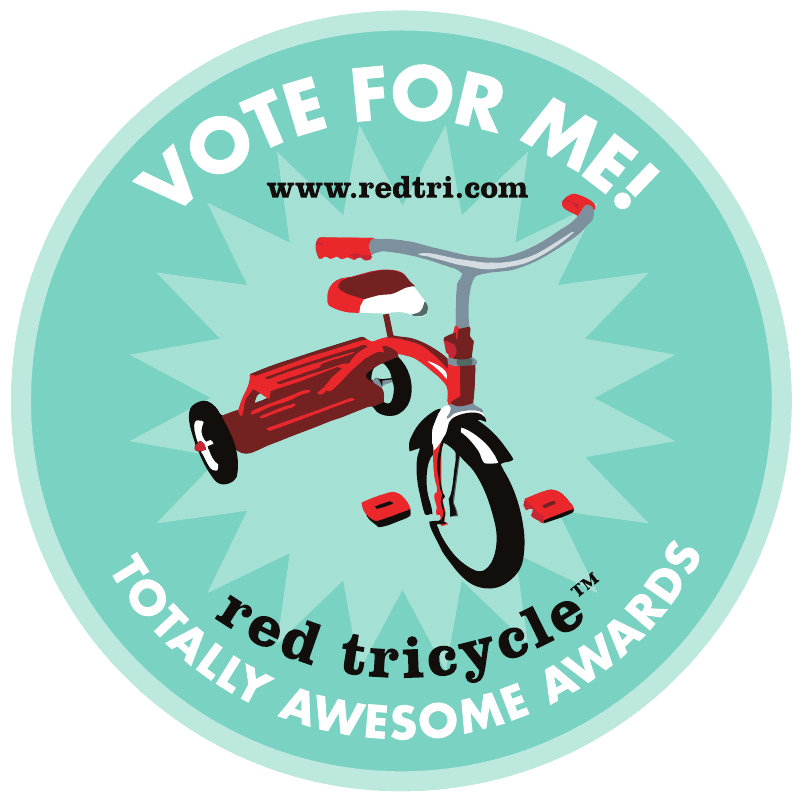 I love your blog-what a fun job you have! I'm in the process of planning our own nursery for our 1st baby. 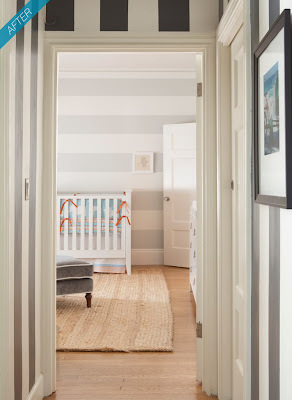 I love these grey/white stripes....do you think it would look good with dark brown furniture? I really love the whole room but didn't know if it was the white furniture that brought it all together. says Kozura, Replica watches UK “I was everybody’s buddy.”Kozura and his wife have beaten a well-worn path to their local post Rolex Daytona office to send and receive aircraft parts to and from all corners of the earth. And they’ve traveled, too Replica Watches – as far away as Europe – to gather aeronautical ingredients.What Kozura couldn’t Replica handbags buy or barter for, he made inside his basement tool shop, where a fuselage lays on a handbag replica giant workbench.